Just in time, a pair of silver tongs for the pastry tray--much prettier than the plastic version I would have bought at Walmart. Love them! And, of course, just today you've seen my affinity for silver utensils as well. They do add a certain elegance, don't they?! Mod Girl was just showing the silver teaspoons she bought at an antique booth for her sister's shower. What a great gift! Beautiful AND a great deal!! How lovely!! I need to visit estate sale, LOL. Of course my husband might disagree with me as I have a whole closet already filled with serving pieces and glass ware and teacups. LOL. I do cater tea parties so alot of this is neccesary, but I would like more serving pieces. These are beautiful! I can't believe how many pieces of silver I see for sale secondhand. I wonder if people know what they really are. Hi Meredith, Thanks for visiting my blog. Snow is such a rarity here that we have to enjoy it while it is here! I have really enjoyed reading your posts! Ahh...I love a good deal. And I'm so honored to have inspired you to paint the next kitchen cabs black :) I'm a white kitchen lover, too. But it just wasn't gonna work this time. Besides, I turned 30 this year and felt like walking on the wild side. Love your blog! I look forward to coming back. Beautiful! I had always shied away from silver until I read your eminently useful post on how to polish and care for it. My mother loves to tell the story of how she got a whole chest of silver with the most elegant, large soup spoons at an estate sale for $15 when no one else seemed interested. A member of the family came up to her afterwards and told her the family history of the silver - it's from England, has an unusual imprint on the back of each spoon bowl (why didn't family buy it - I don't know). Amazing!! We use it at every big dinner we can. I see silver all the time for sale also, but I do not know how to recognize what is valuable and what is a cheap reproduction. What would you reccomend I look for in markings etc. I agree with you silver makes it so elegant, but silver scares me and I rarely buy it. I need to look up your post on how to clean it. This is gorgeous! 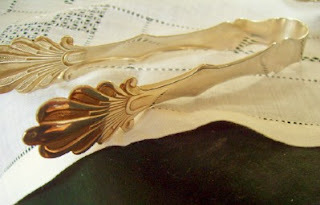 I have a couple of silver antique shop finds that remind me of this piece. Your blog is wonderful; I'm so glad you stopped by and introduced yourself. I'll be visiting often.